Already the largest floating trash island in the world, researchers have found the mass of the Great Pacific Garbage Patch is "increasing exponentially," the Washington Post reports. “I’ve been doing this research for a while, but it was depressing to see,” the Guardian quotes Laurent Lebreton as saying. Lebreton is the lead author of the most comprehensive study of the Patch, which was published Thursday in Scientific Reports. While the actual size of the Patch, which floats in the Pacific Ocean between Hawaii and California, is holding largely steady at around 600,000 square miles—twice the size of Texas or three times the size of France—the mass of plastics it contains is up to 16 times higher than previous estimates. 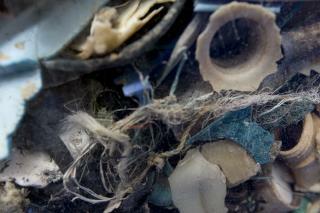 Researchers using 18 boats and two planes found about 79,000 tons of plastic in the Patch. No worries...Mother Nature will tire of us soon enough and wipe us from the face of the planet so more deserving species can take over. It seems like if all this trash is clumping together and forming islands, that would make it pretty easy to clean up.